"Then the righteous will answer Him, 'Lord, when did we see you sick?' The King will answer and say to them, 'Truly I say to you, to the extent that you did it to one of these brothers of Mine, even the least of them, you did it to Me.'" help walking across the room. They still laugh at a good joke, or smile from ear to ear when someone comes to visit, or get that gleam in their eye as they tell the story (for the 20th time) of the infamous trip to the Rocky Mountains back in the 70's. They still love their friends and family, and they still pray for them. Some struggle with the constant stiffness of joints and weakness of muscles, or the frustration of adapting to only having one good arm after a recent stroke. Some can no longer speak clearly; some can no longer see. God looks down on these sometimes forgotten people and He sees them for who they are. God can see their kind and gentle hearts. He hears their longings and their pain. God sees them on a journey in which this is the last and final leg. 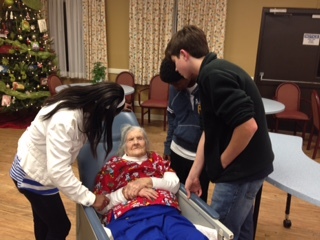 He remembers the day they gave their life to Him; their singing in the choir; their leading the children's Christmas program. 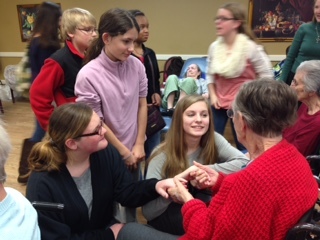 He sees their many decades of love and devotion to Him. He sees them for who they really are. 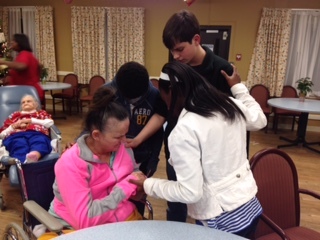 God needs us to be Christ to these people. They need a warm touch of a hand, a kind word, a smile, a hug, an ear to listen to their woes, a prayer, an uplifting song. God needs us to give a little of our time and friendship. And we will feel the love returned. The Scripture reminds us, "Truly I say to you, to the extent that you did it to one of these brothers of Mine, even the least of them, you did it to Me." 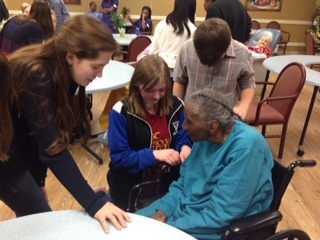 Some of our youth praying with the patients at the nursing home.